I’ve talked on numerous occasions about my love for Bicester Village and how I’ve found some of my favourite pieces of all time there. However, I’m finally learning it’s not a place I can exercise any form of will power. In fact, it’s crack for shopaholics and I always come back broke. This time I headed there declaring to everyone around me I must not buy shoes! Shoes are the very last thing I need right now because I no longer have any space left to put them. So true to form, I managed to come home with 5 pairs. I am currently hanging my head in shame! I remember seeing these Jimmy Choos in Harrods about six months ago and thinking they were pretty special but at £1295 I didn’t even need to look twice (plus where on earth would I wear them?). Anyway, there they were sitting in the middle of the Bicester boutique, half price and in my size. I tried them on to ooos and arrhhs around me but I knew I had to think about it before I spent that kind of money on boots I still had no place to wear to. The sales assistant could see her commission slipping away so offered to ask her manager if they would discount them even further. When she came back and said £350 I couldn’t help but snap them up. There’s a lesson to be learnt here, sometimes the boutiques are so keen to move stock they will be happy to provide a little extra sweetener to encourage you to purchase, so don’t be afraid to ask! These Fendi shoes were another mad and impulsive purchase but I’m so obsessed with the Fendi Monsters at the moment which are either sold out or crazy expensive. When I saw these my heart skipped a beat. They’re so much fun and even if I never wear them, I’ll display them as art somewhere in my home! These two Dolce and Gabbana numbers are basically princess shoes! When I saw the velvet flats I instantly they knew they were coming home with me. They black lace numbers are super comfortable and I keep reading everywhere the kitten heel is back, so clearly I need a pair! Lastly, was these sculptural Dior beauties! They’re pink, gorgeous and unique, need I say more? Shoes weren’t all I treated myself to. One of the boutiques I really wanted to go to was Anya Hindmarch. It’s one of my favourite stores at Bicester Village because the stock is always fantastic and the staff are so lovely. 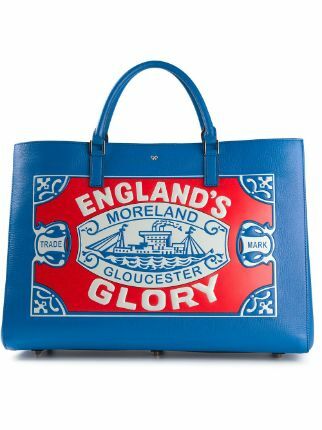 I was looking in particular for one of her fun Ebury bags. Although they didn’t have the exact one I was after they did have 3 from the A/W14 collection (Swan Vestas, Cornflakes and England’s Glory) to choose from. It’s no exaggeration to say I umm’d and err’d for about 40 minutes but it was worth it because I definitely chose the right one in the end! Finally, as If I needed another reason to love Anya Hindmarch, they gave me own Anya branded Frosties box with my bag (yes, it even has Frosties inside). As a true fan of Anya Hindmarch I was so delighted to receive this collectors piece!